Development of motor skills, sensory-motor coordination. Development of the skills of observation, listening, taste and touch through experiential learning. Basic language abilities and numerical skills. Development of the skills of observation, concentration and expression through experiential learning in specially designed Environs. Language, communication and writing skill development. Physical education through games and sports. Art, Craft, Pottery, Slokas, Indian/ Western Music and Dance. Awareness of nutritional needs and cleanliness. Development of mental faculties such as perception, imagination, concentration, reasoning and application. Introduction of III Language (Sanskrit) until class VIII. Aesthetic Sense development through specialized training in art, music, dance, dramatics, pottery, etc. Physical Education through sports, games and yogasanas. Psychic Education (Self Reflection) and guided meditation. Thorough training of the mental faculties such as observation, imagination, reasoning, judgement, analysis, application and evaluation. Development of skills of self-study, effective communication and decision making. Specialized training in music, dance, dramatics, fashion designing, french, art etc. depending on selection. Exposure to Physical Training through games, sports (basket Ball, table tennis and cricket) and yogasanas. Psychic Education (Self- Reflection) and Spiritual discourses. Community Services and Environmental Awareness Program. Excursions, Leadership Camps and Nature Camps. INDIAN SCHOOL CERTIFICATE (ISC – Class XI & XII): Building on the long standing successful experience of training students to clear the X ICSE Board Examination in flying colours, our school took the initiative of introducing ISC for the benefit of our students and others to join us from 2010. The aim is to develop motivated, confident and articulate students with the skills necessary for independent study and growth. It ensures that all students are well prepared for the next stage of education. Fully equipped laboratories wherein research skills are developed. Promotes critical and higher order thinking among the students. Curriculum provides good choice of subjects. Children get exposed to the appreciation of literary works in the English Language and so develop good communicative skills and gain confidence. Internal Examination in the 1st year and Board Examination in the 2nd Year. Coaching is provided by experienced experts in their respective fields for MPC & BiPC students. The school regularly monitors the work done by the students and progress is indicated through monthly periodic reports. Games and Sports also make part their weekly activities for their physical well being. Personality development workshops and value education workshops are conducted to develop their personality. No prescribed Text books till Grade IV: This is to ensure conceptual understanding rather than content based learning. Various text-books and references are reviewed to conduct learning of concepts at every level. Experiential learning in Environs: Well equipped learning Environs are designed for English Language, Math and Environmental Studies which facilitate experiential learning through learning- games and activities. Text Books replaced by Learning Sheets/Work Sheets: These serve the process of understanding and assimilation. They also facilitate learning at individual’s pace and level. No Formal Tests and Examinations till Grade VII: Children are evaluated through different types of assessments. Specific tasks are developed focusing on various skills such as observation, understanding, reasoning, data analysis, experiments, etc. Projects, presentations and group activities also form part of assessments. Progress Reports: Rubric is developed against specific areas of development of faculties of the mind (Intellectual development) viz., Observation, imagination, perception, analysis, Reasoning and judgment, Application and Expression (Oral & Written). Similarly, the rubric also includes observations of the development of their physical abilities, aesthetic sense and emotional growth. 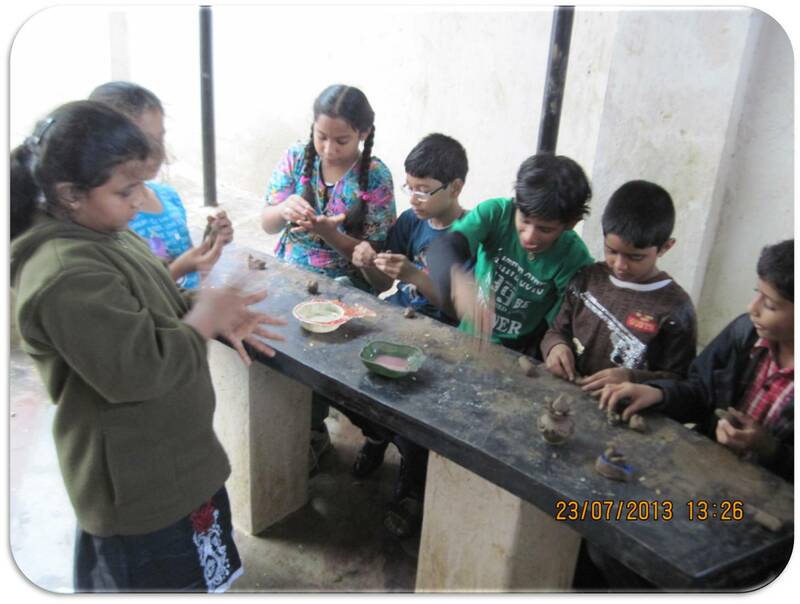 Basic Skill Development Program: Learning of children depends totally on his/her ability to acquire the basic skills. Various worksheets/learning sheets are designed for this purpose. Vital Education: To facilitate sound emotional and character development, specific vital education program is scheduled. Apart from audio-visual sessions, this mainly includes the IDA classes for Performance arts and Skills. Psychic Education: Unique Self-Reflective sheets are provided every year to each child and self analysis is consciously facilitated. Resource persons: Experts from various fields are invited to conduct talks, seminars and workshops. Spiritual Discourses: Talks and discourses are conducted on ‘Unity of Religions’ for senior students. ‘Spiritual Parenting’ is being introduced for parents. Teachers are exposed to talks and workshops on Self Progress. Children with Special Needs: To ensure secure educational background for the children with learning disorders, the school procured accreditation from the NIOS (National Institute of Open School). The children are provided all the facilities to get trained for the same. However, the school shall admit such special students only against vacancies. 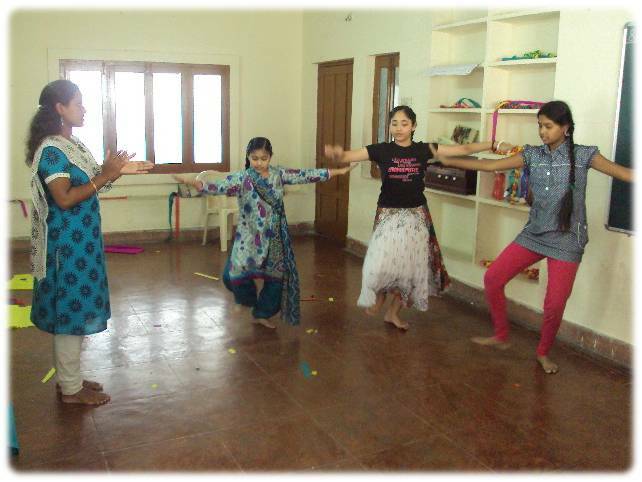 To enhance innate potentials of creativity and aesthetics in children Integral Developmental Activity, classes are conducted for all students of Liberty Section compulsorily in various fields. 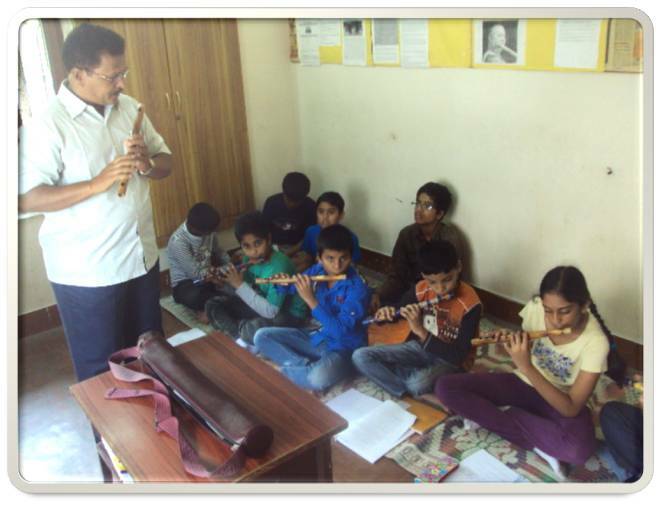 For students of Harmony section it is conducted once a week in two different areas of choice. Children (Middle School) are required to select one among each from a group of Performing Arts and Skill Based Activities. Students of Truth Section (Classes VIII – X) need to opt for any one option provided under Group III (Dance / Music / Arts / Dramatics / Computer Applications / French / Fashion Designing / Home Science) which makes part of ICSE Board Examination. Note: It is best for the student of Harmony Section to opt for his/her choice of activity and continue the same at Truth Section.